This lively street is lined with elegant clothes shops, restaurants and stately buildings constructed in different periods. To its east is Piazza Anfiteatro (Pic n2) which was a Roman amphitheatre now surrounded by private houses, cafès and restaurants. Also to the east is the Piazza San Francesco, the church of the same name and the Museo Nazionale de Villa Guinigi (tel. 0583 49 60 33; Via della Quarquonia) which is housed in the villa built by the Guiginis in the early 1400s. Its collection includes Roman Lucchese vestiges, sculptures and pictures dating back to the period between 13th and 17th century. Furthermore, it displays works by Mannerist Domenico Beccafuma, Corregio, Vasari and Tintoretti, Pietro Paolini and Girolamo Scaglia. Further southeast is the Botanical Garden, an idyllic setting for immersing yourself in nature (Via San Micheletto). Back to Via Fillungo to its west is the Basilica di San Frediano (Pic n3) on the piazza of the same name (tel. 0583 49 36 27). This building is particularly striking due to its facade with 13th century Byzantine style mosaics and westward-looking apse, the 12th century baptismal font adorned with reliefs. Andrea della Robbia’s Annunciation and the capitals taken from the Roman amphitheatre are worth looking at. Palazzo Pfanner (tel. 340 923 30 85; Via degli Asili 33) fa renowned filming location provides a change from Renaissance and religious buildings. It dates from the 18th century and has luxurious room and a lovely garden dotted with Greek and Roman gods statues. Visitors will be captivated by the luxury of its rooms and its 18th century garden dotted with Greek and Roman gods statues. For an example of the rococo style for Via Galli Tassi. There are the Palazzo Mansi and its Pinacoteca Nazionale dating back to the 17th century. 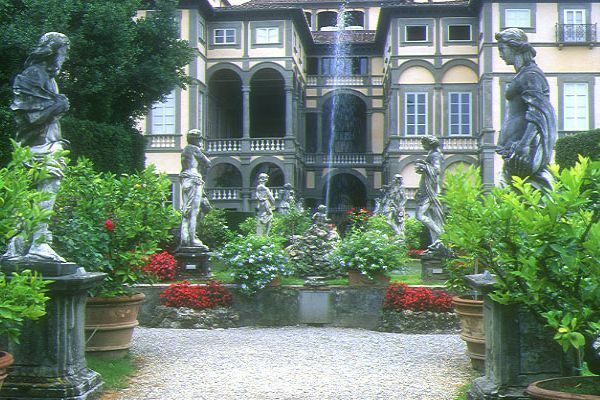 Off Lucca there are many villas (stately houses) which deserve a visit. Of the large number of villas that have been built in the last centuries just a dozen are open to the public. Villa Reale (tel. 0583 3 01 08 on Via Fraga Alta) was built for Elisa Napoleon. Just the gardens are open to the public. Other notable villas include the neoclassical Villa Grabau (tel. 0583 40 60 98) and Villa Oliva (tel. 0583 40 64 62 www.villaoliva.it.) Villa Grabau’s English and Italian garden and Oliva’s three levelled gardens, fountains, carpini covered pergola and extraordinary stables should not be forgotten. The Casa di Puccini (tel. 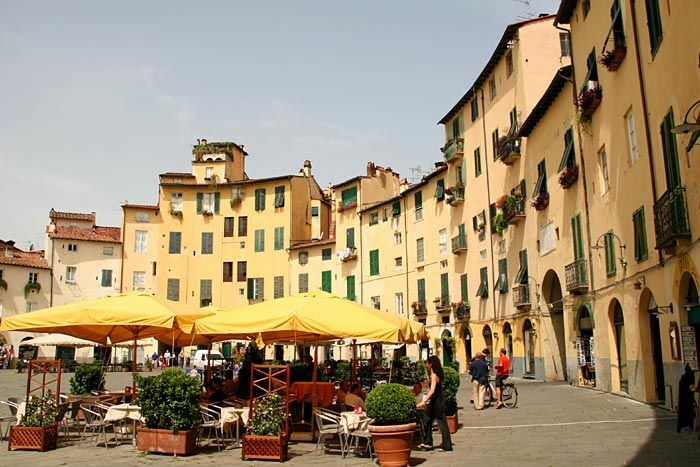 0583 58 40 28) is the simple house where the composer was born and lived until he moved to Milan to study. The house houses everyday objects which belonged to him such as his pen, glasses and piano, and letters, photographs and sketches. Head for Torre delle Ore on Via Fillungo and Torre Guinigi on Via Sant’Andrea ( tel. 0583 31 68 46, the same number for both ) for fabulous views over the town. Its remarkable 12m high walls with their canons still in good conditions have surrounded the old part of town over 5 centuries. The footpath running parallel is a good place for strolling, skating and for children to play.